Nopporo forest Park ("Nopporo shinrin-kouen" in Japanese) is a natural park located 15 km east of Sapporo. It is about 2,051 hectares in area, and is covered with luxuriant forest. Since the late 19th century, the area around Sapporo has been deforested for land reclamation. Then the forest of this park has been preserved for forest conservation. In 1966, the Hokkaido Prefecture held the festival cerebrated 100 years from beginning of immigration. At that time, a memorial area was set up in this park. 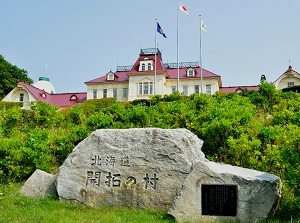 After that, the memorial tower for the 100th anniversary of Hokkaido (in 1970), the Historical Museum of Hokkaido (in 1971) and the Historical Village of Hokkaido (in 1983) were built in this area. The memorial tower for the 100th anniversary of Hokkaido is just 100 meters high, and it has an observatory. The Hokkaido Museum is a museum exhibiting the history, culture, nature and archaeology of Hokkaido. 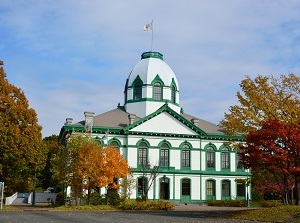 The Historical Village of Hokkaido is an open-air museum which has more than 50 historical buildings of Hokkaido. In summer horse tramway runs, and in winter, horse sleigh runs in the village. And you can see the reproduction of annual events and child's game in pioneer days. Get off at "Shin-Sapporo" station on JR Chitose Line (about 10 minutes from Sapporo) or subway Tozai line. Then, by route bus to "Kaitaku-no-mura", about 10 minutes.